In a major milestone for the space station program, a commercial cargo capsule loaded with nearly a ton of long-awaited experiment samples, broken components and other gear, returned to Earth Sunday, plunging back through the atmosphere to a Pacific Ocean splashdown to wrap up the spacecraft's first operational flight. The Dragon capsule is the first space station cargo ship since the shuttle capable of carrying large amounts of equipment both to and from the lab complex As such, it restores a critical capability for NASA -- the return of experiment samples from the station -- along with failed components that require troubleshooting and analysis. "We see her moving aft and away from us out of the keep-out sphere," Expedition 33 commander Sunita Williams radioed from the station as the SpaceX Dragon capsule departed early Sunday. "It was nice while she was on board. We tamed her, took her (on board) and literally and figuratively, there's a piece of us on that spacecraft going home to Earth." She was referring to urine and other biological samples packed aboard the cargo ship that had been awaiting a ride back to researchers on the ground. "Not only is it going to give us a consistent supply chain up, but very critical, particularly to biological research, is the return mass, to be able to have frozen samples returned home," space station Program Manager Mike Suffredini said earlier. "This really is the keystone to what is going to allow space station to do what it was built to do. It's critical to the success of the station." Designed, built and operated by Space Exploration Technologies -- SpaceX -- under a $1.6 billion contract with NASA, the Dragon capsule was launched from Cape Canaveral, Fla., on Oct. 7, loaded with nearly a half ton of supplies and equipment. It was captured by the station's robot arm three days later and attached to the Earth-facing port of the forward Harmony module. After unloading its cargo, the station crew repacked the capsule with nearly a ton of experiment samples, station components and other gear awaiting return to Earth. Williams and Japanese astronaut Akihiko Hoshide, operating the space station's robot arm, detached Dragon from its berthing port at 7:19 a.m. EDT (GMT-4) Sunday. The astronauts then released the capsule at 9:29 a.m. as the two spacecraft sailed 255 miles above Burma. At that point, SpaceX flight controllers in Hawthorne, Calif., took over active control, using thruster firings to move the capsule away from the space station. At 2:28 p.m., the capsule's braking rockets fired for nine minutes and 50 seconds, dropping the far side of its orbit deep into the atmosphere over the Pacific Ocean. 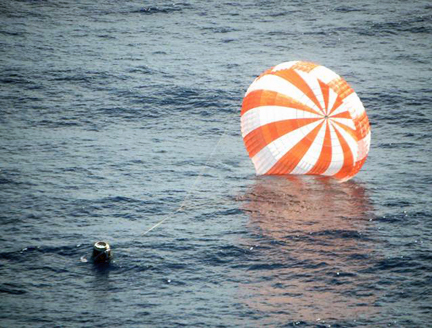 After enduring the heat of re-entry, the capsule's two drogue parachutes deployed at an altitude of about 45,000 feet, slowing the craft enough to permit the release of three large main parachutes at an altitude of around 10,000 feet. 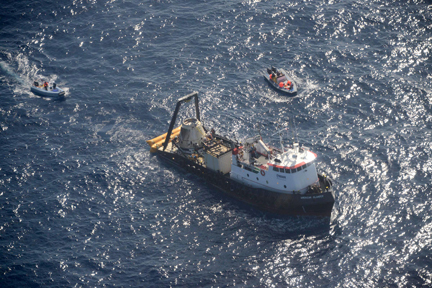 A SpaceX team was standing by in the landing zone 250 miles off the coast of Baja California to recover the spacecraft. "The SpaceX recovery boat sees the vehicle with three main chutes out," NASA mission control radioed the station crew at 3:16 p.m.
"Good news," Williams replied from orbit. "Thanks for the update." A few moments later, at 3:22 p.m., the spacecraft splashed into the Pacific Ocean to complete the return to Earth. 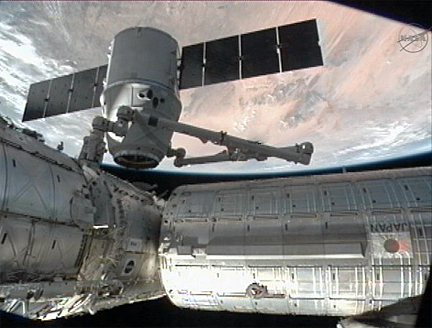 "Station, Houston on two, Dragon is in the Pacific," mission control advised. "Awesome," Williams said. "She made it home to Earth." The SpaceX recovery team quickly hauled the Dragon capsule onto a 100-foot-long recovery vessel for the trip back to California. Time-critical hardware and experiment samples will be turned over to NASA within 48 hours. The spacecraft then will be hauled to a SpaceX facility in McGregor, Texas, where the remaining cargo will be off-loaded. "This historic mission signifies the restoration of America's ability to deliver and return critical space station cargo," SpaceX CEO Elon Musk said in a statement. "The reliability of SpaceX's technology and the strength of our partnership with NASA provide a strong foundation for future missions and achievements to come." The SpaceX commercial resupply contract requires the company to deliver 44,000 pounds of equipment and supplies over 12 flights. To pave the way for operational resupply missions, SpaceX carried out two successful test flights, one that tested the capsule's systems in a solo flight and another that included a berthing at the station last May. The Dragon capsule measures 14.4 feet tall and 12 feet wide, with a trunk section, jettisoned just before re-entry, that extends another 9.2 feet below the capsule's heat shield that houses two solar arrays and an unpressurized cargo bay. The spacecraft can carry up to 7,297 pounds of cargo split between the pressurized and unpressurized sections. Under a separate $440 million contract with NASA, SpaceX engineers are working on upgrades to convert the Dragon capsule into a manned spacecraft that can ferry crews to and from the station. SpaceX managers believe they will be ready for initial manned test flights in the 2015 timeframe, assuming continued NASA funding. Two other companies, Boeing and Sierra Nevada, are developing their own spacecraft designs under similar contracts. For Dragon's first Commercial Resupply Service mission -- CRS-1 -- the SpaceX cargo capsule delivered 882 pounds of hardware, supplies and equipment to the space station, including 260 pounds of crew food and supplies, 390 pounds of science gear and 225 pounds of spare parts and other station hardware. For its return to Earth, the Dragon was packed with about 1,673 pounds of experiment samples and hardware, including 163 pounds of crew supplies, 518 pounds of station hardware, 123 pounds of computer gear and Russian equipment and 866 pounds of science gear and experiment samples.